Kama Cabinet Pro is a storage box for a 5.25" bay of your pc case. It utilizes free space inside the pc case allowing it to be used more useful for storing various items like Hard Drives, USB Sticks, Handys or MP3 Players. The Kama Cabinet Pro is equipped with two USB 2.0/1.1 connectors and two bright LEDs installed for perfect illumination. Splitter plates are supplied in order to divide the space inside Kama Cabinet Pro for everyone's requirements. The Kama Cabinet Pro is equipped with two USB 2.0/1.1 connectors and two bright LEDs installed for perfect illumination. USB 2.0/1.1 makes data transfer, recharging mobile devices slick and easy. 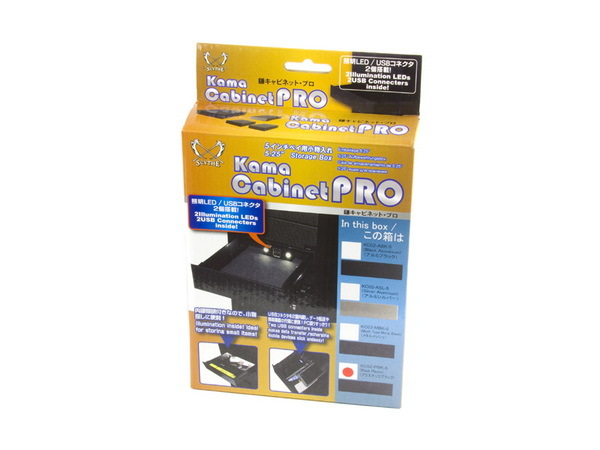 Kama Cabinet Pro is a small storage for your pc case. It utilizes free space inside the pc case allowing it to be used more useful for storing various items like Hard Drives, USB Sticks, Handys or MP3 Player. 280 g / 9.7 oz.